Our March program began with Laura Harbolt, Director of Volunteer Services, Hosparus Health, thanking us for our service to their patients and introduced Susan Norswothy, Volunteer Manager. Susan told us 1,000 patients were served daily by members of the current 80 personnel volunteer force. Of these volunteers, 8 are active veteran volunteers who attempt to meet the needs of 4 veteran requests per week. Susan would love to meet potential Veteran volunteers willing to present lectures on a wide variety of pertinent topics related to Hosparus Health. Ms. Harbolt then introduced our featured speaker, Mr. Gerry Hope. Gerry is a retired military pharmacist whose retirement goal was to give back. He can always to counted on to support a veteran with any need required. For the past 5-6 years, Gerry has conducted a small recognition ceremony to each Veteran. This includes a certificate which states in part that their service was significant to his country. Along with the certificate, a quilt or cap is presented. Gerry wanted us to know there is something special about touching a piece of cloth and knowing someone took the time to make the quilt and then give it away. 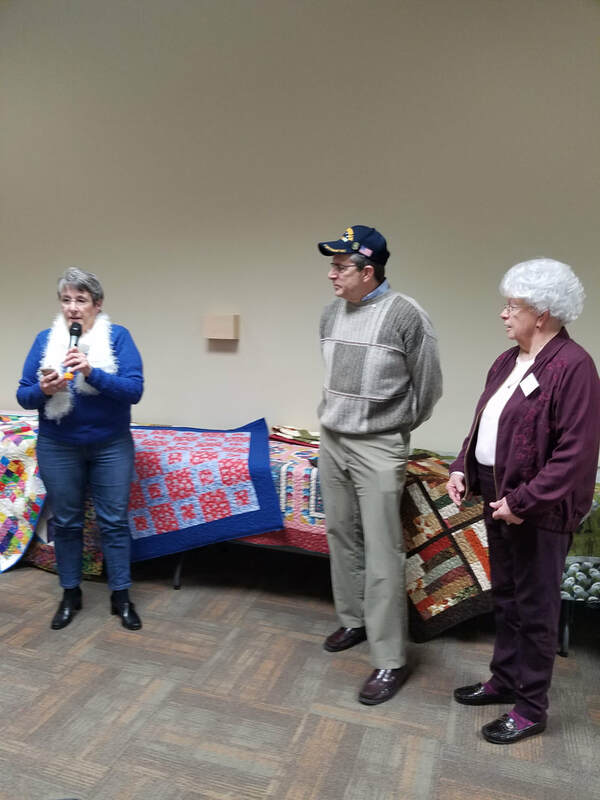 It touches the Veteran deeply to learn their service was that significant to receive a quilt from an unknown quilter. He wanted us to know in our hearts our quilts make a difference and are treasured by the Veteran and their families. 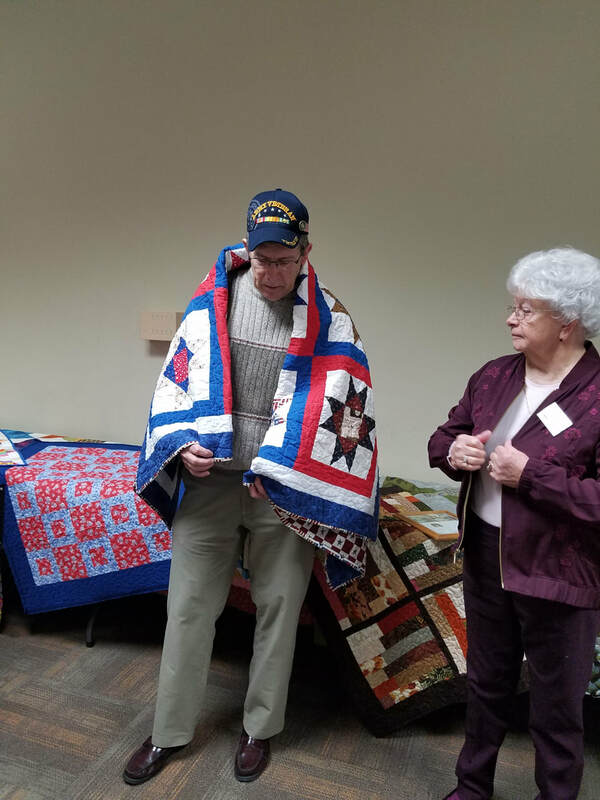 The photo below shows Gerry with the 21 Patriotic quilts prepared for his presentations. He is holding is QOV presented this day at our meeting. 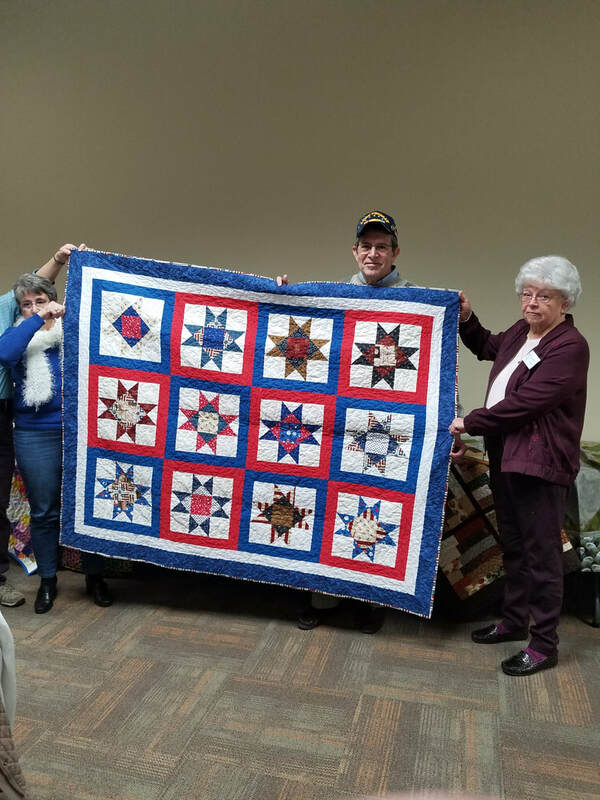 Scroll down to see the hug quilts and then the QOV presentation. 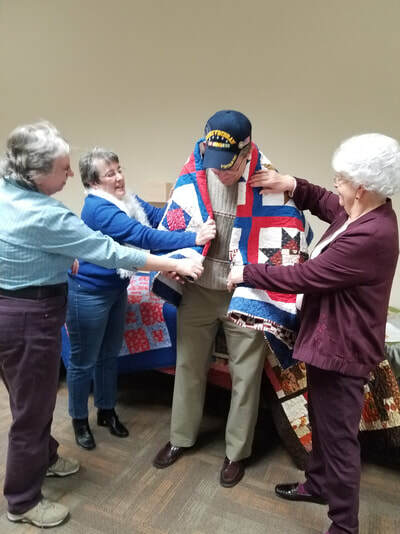 Susie Meagher, QOV Coordinator, and Nancy Wiseman, Quilter, presented Gerry with a Quilt of Valor for his military service to our country. And we all applauded that service and his continued work with all Veterans he has the privilege to serve in his volunteer role with Hosparus Health.